Confession: I’m a bit of a coin junkie. Not enough to know a lot about coins, but enough to squirrel away change to sort through later. That’s exactly what I was doing a couple weeks ago—digging through change to see if any of the coins were worth holding onto. As I dug through a pile of pennies, I marveled at the shiny ones, although they were generally newer and not what I was looking for. And I winced when I found ones covered in who knows what, battered and barely recognizable. And as I sorted and sifted, I noticed something that I found striking: it wasn’t always easy to guess the year of the coin based on its appearance. I mean, you’d think the new ones would be shiny and the older ones dull, but that wasn’t always the case. Take these four pennies, for example. They’re all the same age, almost two decades old. And yet, life has treated them differently. The bottom right one is still quite shiny, relatively unmarred by two decades of being tossed around and changing hands, whereas the years definitely show on the top left one. The other two fall somewhere in between in terms of wear. It’s interesting to imagine the journeys these coins have taken. It’s likely the two on the top row have had longer journeys. The D they bear denotes minting at the Denver mint, while the other two were created in Philadelphia. Since I grew up in NC and now live in VA, the D coins have always been slightly less common and therefore a more interesting discovery. 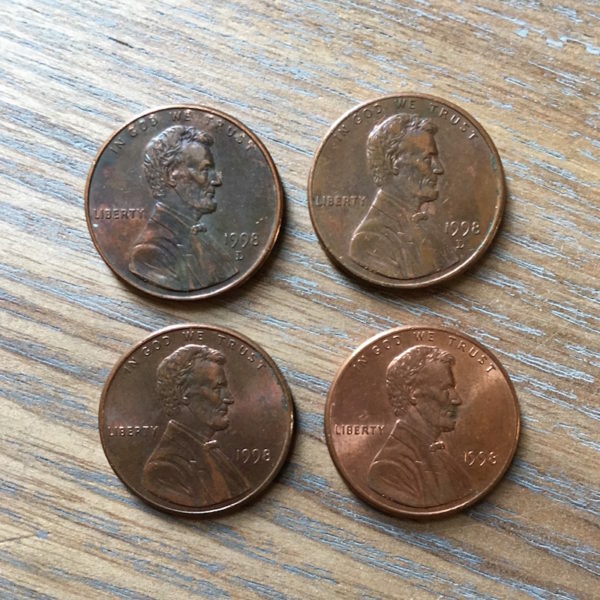 All four of these pennies began the same way: freshly minted, shiny, shaped out of the same composition of zinc and copper. But life treated them differently. Their journeys over the past nineteen years have resulted in different appearances. But they all have the same value. People are much like pennies. Our journeys vary, and the wear-and-tear of life shows on us in unique ways. Like these pennies, hardships sometimes happen to us. But unlike these pennies, we get to make choices. There is much we can’t control, but we do get to decide how we respond to the nicks and dings from the sharp edges of life. And though the shiny penny may seem ideal, it’s the dirty, dinged-up penny that probably has a better story to tell. It’s a fighter, that penny. I don’t know about you, but I don’t want to get to the end of my life still a shiny penny, one that sat safely on a shelf, valuing a pretty surface over the scars of living. I don’t want to run from a fight or cave to the pressures. When I get knocked down, I don’t want to stay down or slink away to safety. I want to get back up, no matter how many times I get knocked down again. I’ll accept those dents. I’ll wear those scars. I won’t hide from the hard times—I’ll fight my way through them. Because I don’t want to be a pretty penny; I want to be the one with a story to tell.